The Adventures of Bayou Billy! Wild Gunman! Hogan's Alley! Starting with Duck Hunt in late 2014, Nintendo has been retrofitting and re-releasing - along with third-party partners - some iconic NES light gun / Zapper games for the Wii U eShop. They naturally utilise the Wii Remote pointer to recreate that old-fashioned practice of zapping pixels on the TV. Since Duck Hunt a few more titles have arrived in Europe, and according to Nintendo of America's game pages the region looks set to catch up in this week's Download Update on 7th January. These game page don't always have 100% accuracy, but in this case we think they're a good bet. Below are the three games pegged to arrive on the North American Wii U Virtual Console this week priced at $4.99, along with our review scores. The Adventures of Bayou Billy isn't a straight-up light gun game like the others, but features a few Zapper sections. Are any of you in North America tempted to pick these up? With thanks the Ryan Millar for the heads up. Who's Ryan Millar? You guys are always thanking him in alot of your articles. Looks like three more new games i'll get to try. Would be cool to get games like Yoshi's Safari, TinStar, and those other SNES light gun games too. Where are the EU virtual console releases? Mario RPG, the DS Zeldas, Mario 64 DS? I swear Nintendo of America has absolutely no clue what we want. Since there's a game drought after heavy hitters on the Wii U this holiday season NOA was holding back on big VC titles and this is the beginning of 3 VC titles a week release says Reggie. @Tasuki One of the regular readers who sends in news tips. If it's something that I haven't seen myself yet I like to tip my hat in thanks. Yes!! I want to get all 3 of those games!!! I rented Bayou Billy every weekend for a long time. Can't remember if I ever beat it. I remember it was on the cover of Nintendo Power when it was first released. As far as he games go. I have fond memories of playing bayou billy at a friends house and I never got around to playing the other two. So I will probably end up getting all of them. Reggie really screwing us over here. Why this??? Why not Super Mario RPG???? What gives? @Bucho These three games are some of those EU VC releases. Hopefully this is a sign of VC heavy rotation till LoZTP comes out. Maybe we can catch up to and exceed what NoE has. Wild Gunman, only three months after it was relevant! Gee, thanks, NoA! No, I really mean it. Thanks. You aren't usually this on top of things. Don't quite understand why some people want Mario RPG over these VC games. These games have never been released on VC before and you can still download Mario RPG on the Wii shop channel on the Wii menu. well at least, it's something.... Right? Spare me Hogans Alley. I want Europe releases like Animal Crossing, RE 4, Wave Racer. oh yeah,rock n roll... wait who is ryan milliar?? I'll be picking up a few of these probably. Bayou Billy for sure! Wait, what's this about us now getting three VC games a week? If that's true, then about time. I'd like some parity between regional eShops. @Spin I was hoping for a Yoshi's Safari vc release since the Wii. I'd buy that day one. @ThomasBW84 Ah ok I wasn't sure if he was a staff member or a writer from another site. That's great you give him kudos. Another reason why this site is good. These games... Sure. I can't tell NoA how to run their shop, but it would've been nice to have seen these alongside Duck Hunt, or even have a promotion when bought together. I'd much rather see SNES games get uploaded. I'd love to revisit my one of my childhood favorites, Yoshi's Safari, and finally try Super Scope 6 and Battle Clash. On a postive note. Still playing XCX and MARIO MAKER! Yeah. I'll grab these 3 for sure, but I'd love Yoshi's Safari too! Haven't played it since it was released a long time ago! I really wish they would discount gaiaibreaker. $15 seems too much for a shoot'em up. Ohhh man... an eShop rush of Virtual Console games to carry us through until 2017!!!! NoA you've put in a good effort for 2016, why not sit back and get into the ''routine'' for the rest of the year, eh? Mine, mine, MINE!!! Has this ever happened? 3 VC games in one week? If only it had been like this through out the Wii U's life. Well that's certainly disappointing, NOE gets the good stuff while NOA gets gypped. Thanks, Reggie. Another week Nintendo doesn't get my money, then. Same here, they must not care about money or us users, and all three games got 5/10, what a lovely score that is. 3 vc releases in NA in one week??? Cmon! I'll believe it when i see it! And if it does happen then NOA still missing a lot of stuff that Europe has already....forget Japan! Like most people I look forward to the weekly VC releases and am routinely disappointed, but I have to admit I'm legitimately excited about Bayou Billy. Missed the mark of the last year....but this will do. @joey302 we got three games a once like 3 weeks ago. They were all mega man games. @mikegamer I guess you don't like any games that have scored a 5? @Stu13 I've never owned a gun. Nice stereotype tho. I will buy these games. I love light gun games. I would love it if they released Barker Bill's Trick Shooting next! @Stu13 Nice one, I get it! Because there are people who are dead! 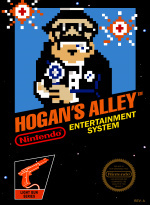 I actually liked Hogan's Alley and The Adventures of Bayou Billy back on the nes. 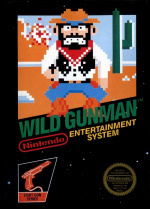 I never played Wild Gunman that I can remember because I was born in 85. I purchased duck hunt on the Wii U VC and I actually thought it was to easy with a cross-hair on the screen so I don't really know if I will be repurchasing these games since I think they will actually be to easy this time around with the cross-hair. Also I miss the flashing screen when you pull the trigger on the light gun. I'm a bit shocked to see Nintendo putting ANY effort into updating Virtual Console titles. The fact that they diverted some resources to preserve these classics on a modern system is great to see! Too bad the 3DS VC is dead. I'm from Georgia. I like my guns. Crackheads that like to break into houses, hurt and kill people, and steal hard earned property have consciously made a decision to go into the next life early. Now if they knock on my door starving, politely ask for food, and are wearing a Super Mario shirt... Well. I'm driving them to Pizza Hut. Nintendo there is something called the 3DS virtual console I think it needs attention it is looking pale. @VR32F1END @Zach @mikegamer @faint Yeah, I was in a really bad mood last night and that was kinda tactless. I stand by what I said, but this obviously isn't the place for it. Apologies. Well it's a start, let's see if they can keep this up over the next few weeks. 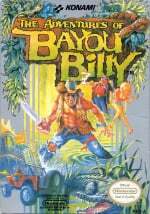 I remember playing Bayou Billy as a rental as a kid because it was interesting (and a Konami game) and being completely frustrated by the cheapness of the game. This is from someone that owned and like Renegade. I miss the days when Konami and Ultra Games were usually the best of the best. I am thrilled with all of the Virtual console goodness! Quite alright. Thought what you said was kinda funny, thats why my response was sort of smug. I stand by what I said too. Hope you're having a better day. @faint I gotcha man. Just pointing out how NOA just pisses me off! !😡😡 no reason, rhythm or rhyme with anything that they do! Do you guys actually read up on something before you post?